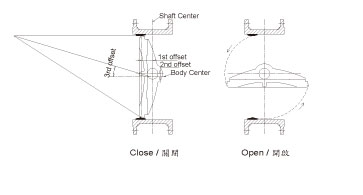 The butterfly valve can be classified to centric shaft, single eccentric, dual eccentric and tri-eccentric butterfly valves according to the relative positions of the valve seat and the valve shaft center or valve body center. The centric type butterfly valve is generally of full-lined rubber design, and its valve disc have double-sided pressure-holding characteristic. The shaft rubber of the valve body lining can isolate the valve shaft from the contact of fluid completely. It is the butterfly valve with high C/P value, simple structure and low price. 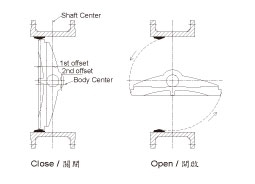 When the valve disc are open, the valve seat will be separated from the disc seat gradually. When they are fully open, only the valve seat near two sides of the valve shaft contacts the disc seat, but approaching separating status. 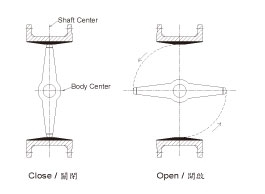 This design is better than the straight shaft one, which reduces the extrusion and mechanical wear generated between the valve seat and disc seat during the operation process of the butterfly valve. The dual eccentric valve seat design achieves more ideal sealing and pressure-resistant performance when the valve disc are fully closed, and reduce the torque effectively and increase the valve seat’s service life. 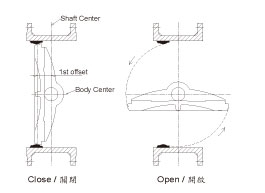 When the valve disc are open, the valve seat will be separated from the disc seat more quickly; when they are fully open, the valve seat will be completely separated from the disc seat, avoiding permanent deformation of the valve seat near two sides of the valve shaft, which will affect the valve’s sealing performance. The tri-eccentric valve seat design achieves perfect sealing and pressure-resistant performance when the valve disc are fully closed, and can reduce the operating torque significantly and increase the seat’s service life considerably. When the valve disc are open, the valve seat will be separated from the disc seat immediately. During the operating process, there is almost no friction stroke, which can eliminate the mechanical wear and scratch generated between the valve seat and disc seat. Therefore, it is commonly applied to the metal-metal valve seat design, and suitable in high-temperature and high-pressure fluid environment. Please download Our Catalog to discover the parts you are looking for or Contact us.